But a prostitutes' rights activist said the scheme amounted to double taxation. 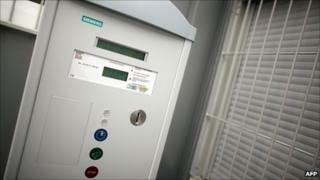 Isabelle Klotz, a spokeswoman for the city, said they expected to get about 200,000 euros per year from the meter. "Women who work in brothels also pay the tax but until now it had been difficult to get women on the street to pay," she added. "Thanks to this new method we will be able to tax them in all fairness with the others." There are believed to be about 200 prostitutes in Bonn. Juanita Rosina Henning, from the Dona Carmen prostitute support group, demanded the meter's removal, saying prostitutes already paid income tax. "This has nothing to do with fiscal equality," she said. City officials have restricted the prostitutes' areas of operation to specific quarters but critics say this has made it easier for prostitutes to ply their trade, Reuters news agency reports. Bonn has also erected "consummation areas", or wooden garages clients may use to visit prostitutes.